Man, the squeeze in lithium supply is acute. So tight that one big car manufacturer is rushing to secure supply. And others are likely to follow. What’s that mean for investors? A chance to ride this wave to massive profits. 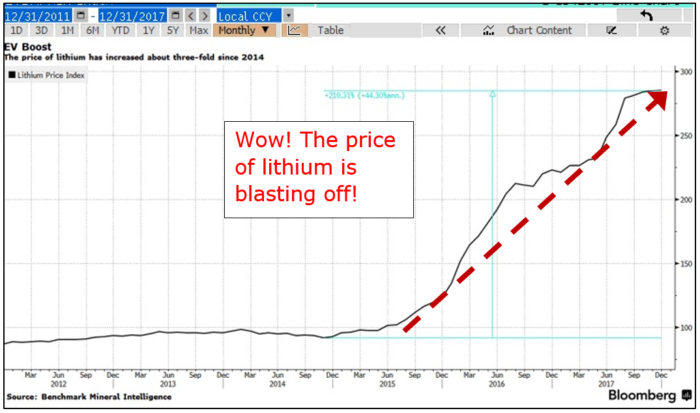 First, let’s look at a chart of lithium prices. See if you can spot the trend. Check it out. The price of lithium has increased threefold since 2014. And on Tuesday, somebody stepped on the gas again. That somebody is Toyota Motor Corp. (NYSE: TM). Its trading arm, Toyota Tsusho, is taking a 15% stake in Orocobre Ltd. (OTC: OROCF), which is building its Olaroz mine in the richest part of South America’s lithium triangle. I own Orocobre personally. And for good reason. It owns one of the world’s great lithium projects. And it’s on track to be one of the world’s great lithium mines. Orocobre reported production of lithium carbonate rose 84% in the last three months of 2017. That lifted the company to record revenue of $40 million. Toyota thinks it’s a great project, too. In fact, it wants that mine to produce more lithium. So, it is investing $232 million to more than double the capacity of Olaroz to 42,500 metric tons a year. This expansion will make Orocobre one of the world’s biggest and lowest-cost producers of lithium carbonate. Here’s the wild part: Toyota is buying the shares at a premium, not a discount. It is paying $7.50 per share. Orocobre shares have never traded above $7.27, and they were recently at $7.17. Why did Toyota pay so much? It doesn’t think it’s overpaying. It wants to secure that lithium supply, because it can see the future is in electric vehicles (EVs). EV sales were only 1% of car sales in 2017. But EV car sales are growing by astounding leaps and bounds. And to build EVs, carmakers need a reliable source of lithium. Orocobre and Toyota Tsusho are also finalizing plans to jointly develop a 10,000-ton-a-year lithium hydroxide plant in Japan’s Fukushima prefecture. The final investment decision is expected in mid-2018. This is big news. But it’s actually the third big investment by a major car manufacturer in a lithium mine in the past year. Americans don’t hear about these events because the car companies are Chinese. In March, Chinese car and battery company BYD said it planned to invest $78 million in a miner to explore for lithium in China’s province of Qinghai. And Great Wall Motor Company agreed in September to invest in Pilbara Minerals, which owns the Pilgangoora lithium-tantalum project in Western Australia. Funny enough, the news of the Toyota/Orocobre deal sent some big lithium stocks lower. Albemarle Corp. (NYSE: ALB) fell by 4%. Chilean producer Sociedad Química y Minera de Chile (NYSE: SQM) fell by 6%. The reason is that traders fear a looming surplus of lithium on the market. They shouldn’t worry. New projects take years to ramp up. Sure, this market will top out some day. But probably not soon. 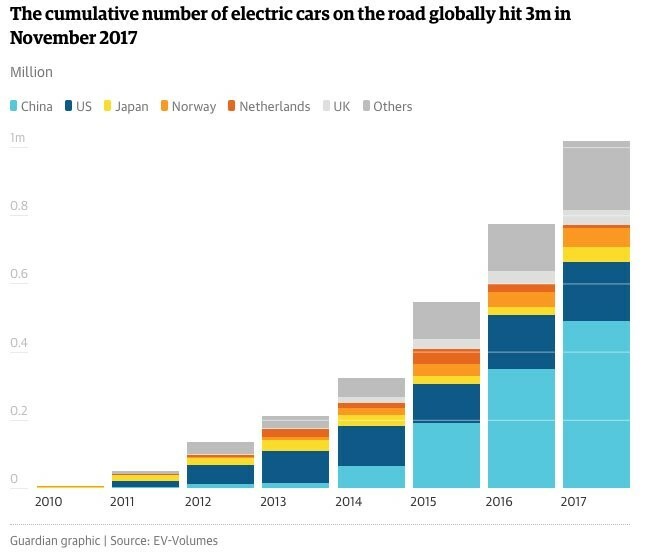 Not the way China is leading the world into accelerating the move to electric vehicles. Orocobre halted trading on the news and won’t trade again until Friday. I guess I’ll find out if I made the right bet then. Toyota certainly thinks it got a deal. But investors should be asking themselves: “Who’s next?” And that’s a two-sided question. On the one side, we have large automakers that are announcing massive shifts to building EV cars. Where are they going to get the lithium, cobalt and other metals they’ll need to build EV cars? Heck, Ford just announced it’s going to invest $11 billion to launch 16 electric cars and 26 hybrids by 2022. If the fellows at Ford are wearing their thinking caps, they must be thinking about sourcing lithium and cobalt. They must be sweating the squeezing grip of the metal fist. The fist that could prevent them from achieving their EV goals, simply because they might not have enough supply. On the other side, which small companies are going to receive massive investments next? Near-term projects in the pipeline. Maybe all my picks won’t win … but odds favor at least some of them surging across the finish line. The race is on. By that, I mean the race for an EV future. Investors who pick the right companies can make fortunes. You need to get busy in this space. Or get left behind. Editor’s Note: In an exclusive presentation, natural resource expert Matt Badiali will be discussing his groundbreaking three-part strategy for targeting major windfalls with junior mining stocks … a strategy that recently helped him grab a personal return of 4,400% within a mere 12 months. To sign up to watch the presentation, simply click here now.